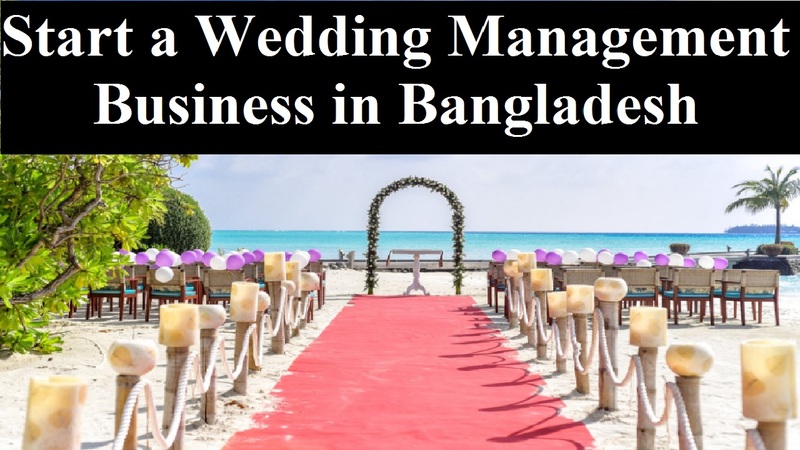 Wedding management business in Bangladesh could be one of the exciting business industries. You probably have a passion for romance and for the beauty of weddings if you fee the interest in this type of business. Also, you may have your plan for your own wedding when you’re experienced in this field. However, if you want to begin a wedding management venture that will blossom into a successful business, a solid business plan is essential. But, if you’re organized, driven, and creative, this business may be right for you. Moreover, along with some business know-how to manage your finances, you’ll need to have people skills to deal with frazzled brides. Although the business doesn’t require a professional degree compulsorily, you must have a wide experience of planning and arranging things. Couples have increased their disposable income, married more frequently and spent more on hiring wedding management business because the economy of Bangladesh has gotten stronger in the past ten years. Also, as it makes your business more accessible to potential clients, the internet reduces your marketing costs and increases your profit margins. On the other hand, as a wedding planner, it’s a great time to start a small business. Now, helping them make their nuptials unforgettable and special while it’s drawing more brides and grooms to your door looking for someone. Besides, when you have the skills and the capital to make a name for yourself as a wedding planner who can deliver dreams on any scale, it’s a growing business that offers opportunities for lucrative returns for your efforts. When you’re in a wedding management business in Bangladesh, you’ll be an artist, a juggler, a referee, and a visionary. Although you’ll get the reward for many years to come if you start your business the right way and operate it well, it’s extremely a hard work. Still are you eager to start the business? Well, let’s know the top steps that will help you to start successfully and survive in the business. When you’re employed by someone else can be a great way to join the wedding industry, you can learn the business. Although you can jump in with both feet and start your own business, a lot can be said for gaining experience working as an on-site event coordinator for a reception venue or catering company. So, when there are many venues and caterers, event coordination is an entry-level position for this business. And having no financial risks of business ownership, it allows you to gain experience. Also, as you’re exposed to a wide variety of weddings and events, you’ll also have an opportunity to work with a variety of wedding vendors from bands to photographers to cake bakers. So, you’ll perform most of the essential tasks that a wedding planner is responsible for because the wedding involves many protocols and traditions. When you’re in a wedding management business, you’ll need to set your own goals, to keep your business on track without a boss or manager. This is because you’re your own boss. That’s why; you must give yourself a realistic idea of how you can improve upon that number and how much you’ll make. So, find out a certain time to meet with local vendors, for example, meeting with 15 local flower shops within a month. And don’t forget vowing to take a few courses to brush up on business skills to set personal goals for you. As the wedding management business isn’t hugely expensive, you’re lucky in this issue. Also, you don’t need an office space other than your kitchen table as an independent consultant. However, you can’t avoid some of the up-front costs that are obligatory for your business. For example, if don’t know the procedures for registering your business, you have to hire a lawyer to do these. Moreover, the lawyer will protect your personal assets from liability. And before you take on their wedding, you can use drawing up basic contracts with your clients. Moreover, for marketing and office supplies, you’ll need to put some money. As a wedding management business owner, the main way you’ll sell your services other than word-of-mouth. That’s through an online portfolio. You have to include the reception table, decorations, and the cake while you’re photo shooting of a mock wedding. As the portfolio is an item to show off your familiarity with the hottest wedding trends, you can also add details. Moreover, it’s a good opportunity to use this to work with local vendors. So, you can offer them referrals in exchange for contributing to your mock wedding. When there are your relatives’ weddings to which you have contributed, take written testimonials and pictures from your friends. And put these all in your portfolio as well. In order to market their company, most small business owners spend at least 25% of their time. However, the task is not expensive or time-consuming auspiciously. You can do the task in simple while setting up a website with your portfolio. Also, if create a Facebook business page to share the latest wedding trends and statistics along with photos from the weddings you’ve helped plan, it’ll be a good marketing of your business. Moreover, you can use other social media platforms like Pinterest, Instagram etc. When you’re starting a business of any kind, it’s always a smart idea consulting with a lawyer. So, if it comes to determining the best business structure then he/ she can provide invaluable advice. In case, you’ll register your business name whether that’s a sole proprietorship, an LLC, or a corporation. Besides, a lawyer will also review the documents you plan to use in your business. These include a client contract, or can help you create them.